I’ve been up Mt.Teneriffe many times, with many people. It’s been a favorite of mine since I first trudged up it’s steep slopes, if not for the views and the challenge of getting to the top, then certainly for the lack of crowds. 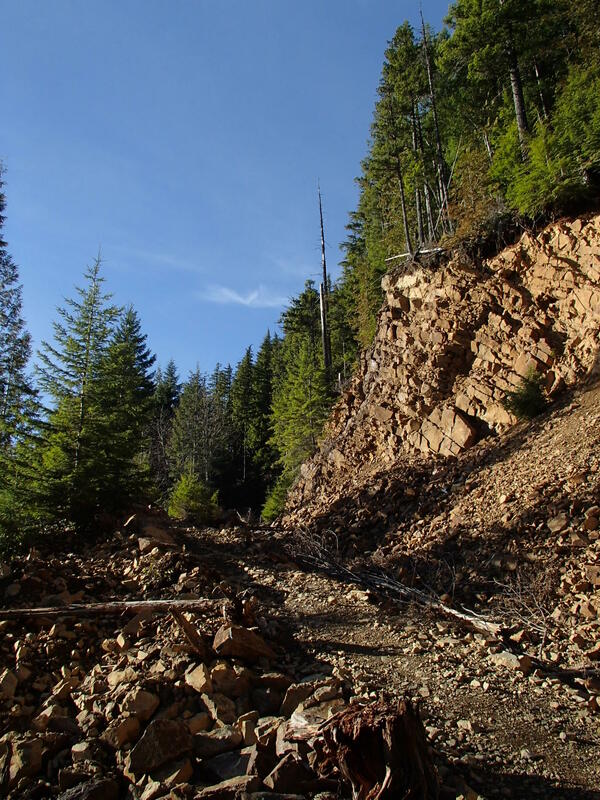 I hadn’t been here in a couple years though, and was surprised this time around to see that some pretty significant changes have been made, namely a new trail to the summit. 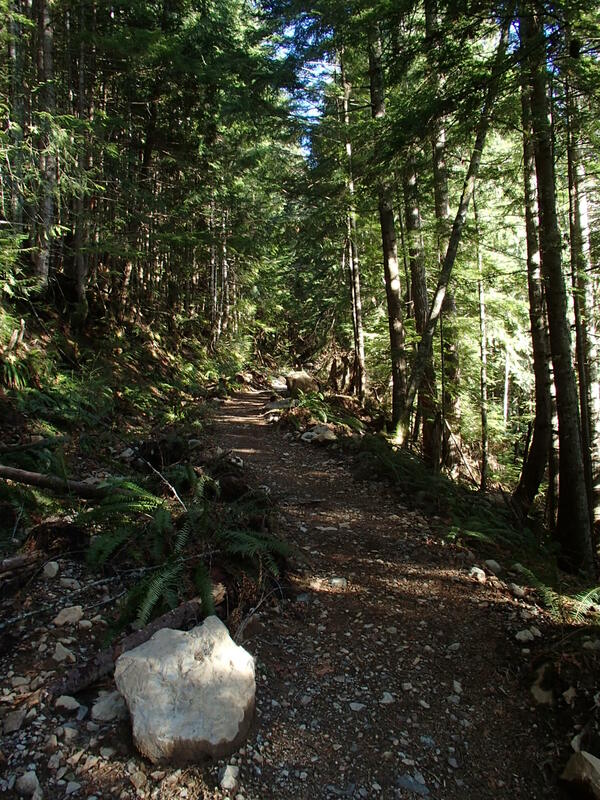 While those in the know have for years known that an alternate to the Kamikaze route existed, slogging up old logging roads and faint boot paths between Mt.Si and Teneriffe, as of late summer 2014 the WA DNR turned it into an official trail. Great right!? A steady moderate grade on a nice even surface as compared to the stiff hike and light scrambling it used to take to get to the top, I’ll bite! Hell, I can even loop it with ease now, and I do love a good loop. Well all is not as it seems, for what the new trail offers in easy grade, it doles out distance in spades. 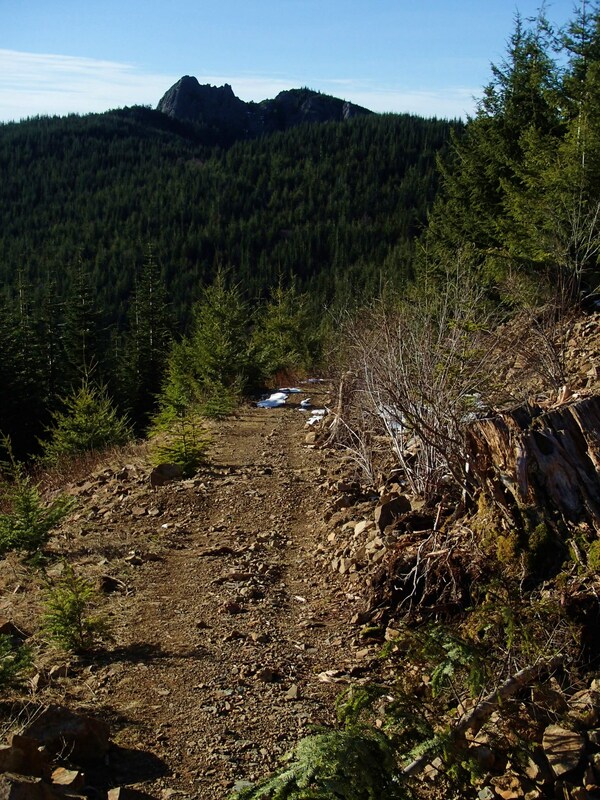 The new trail is 7 miles to Teneriffe summit! Yowza! That’s compared to the steeper old path which is only a couple miles from trailhead to mountaintop. The Teneriffe trailhead is little more than a dirt turn out a little ways further down the road from the much more popular Mt.Si trailhead. While the Mt.Si trailhead is tantamount to a Wal*Mart parking lot, the Teneriffe trailhead really can’t hold more than a dozen vehicles at best. There are “No Parking” signs along the road and I understand that the neighbors WILL call the towing company. During peak season, the strategy here is to get in early, or get lucky, oh and a Discover Pass is required to park. The trail begins uneventfully enough down a DNR road passing through young forest, most likely logged in the early 80s. The road comes to a fork that until very recently wasn’t marked. 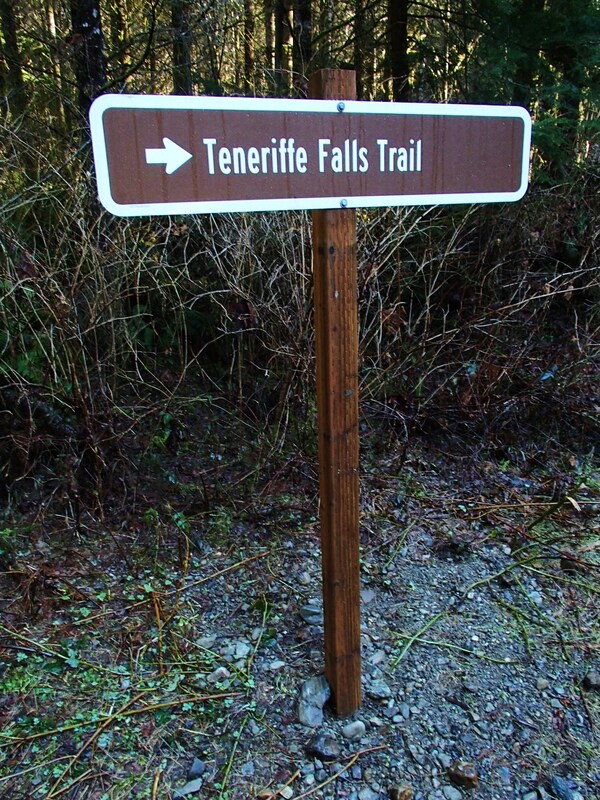 You’d just have to know which way to go, but now there is a shiny new sign directing hikers to bear right to “Teneriffe Falls”. The left fork as of this writing is still unmarked, this is the “new” trail between Mt.Si and Mt.Teneriffe. Heading left, the trail continues along the DNR road passing little rivulets cascading down the mountainside before climbing up into denser forest. The grade is mostly modest but long. 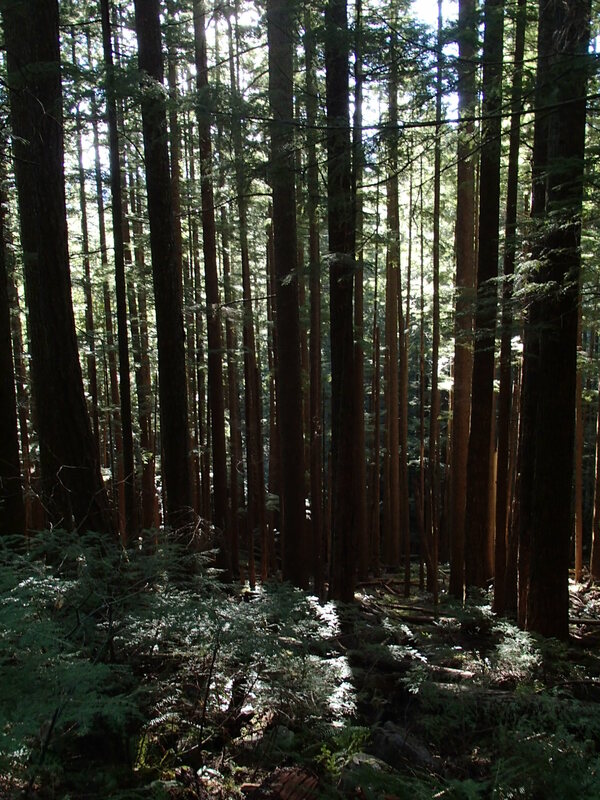 However it does travel through pleasant forest and every so often slight views will open up in thinner stands of trees which breaks up the monotony a bit. 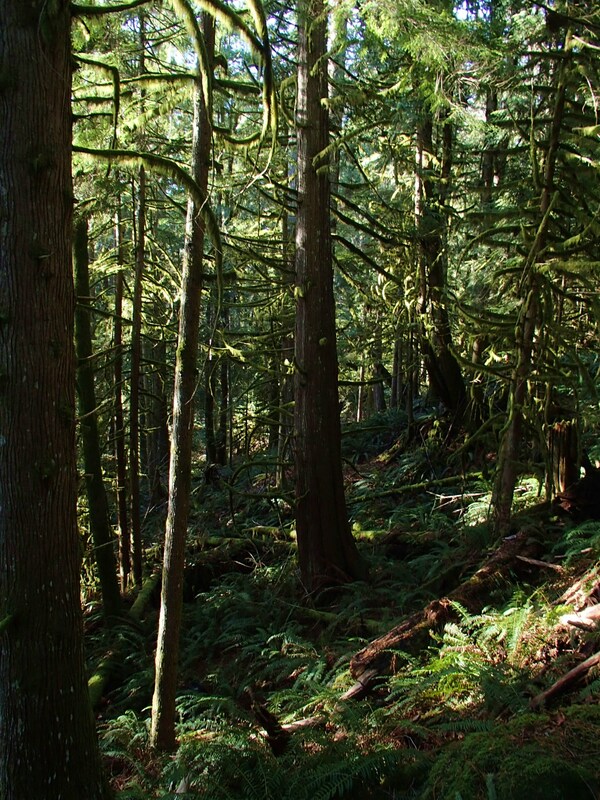 When I was passing through, the forest was alive with the songs of black-capped chickadees and Varied Thrush, which made me wonder why in the hell anyone wears headphones while they hike, I mean really! Just about then a trailrunner jogged by with headphones on, eh, to each their own I guess. Which reminds me, I imagine this would be a great trail for trailrunning as the grade is mostly very even and the path is broad. Ahem…. So after about four miles or so of long switchbacks the grade relents a bit and the views start to be revealed. A fork will appear in the road around this time. As of this writing it is marked with a blue ribbon, but really it’d be impossible to miss whether or not that shred of plastic was dangling there. 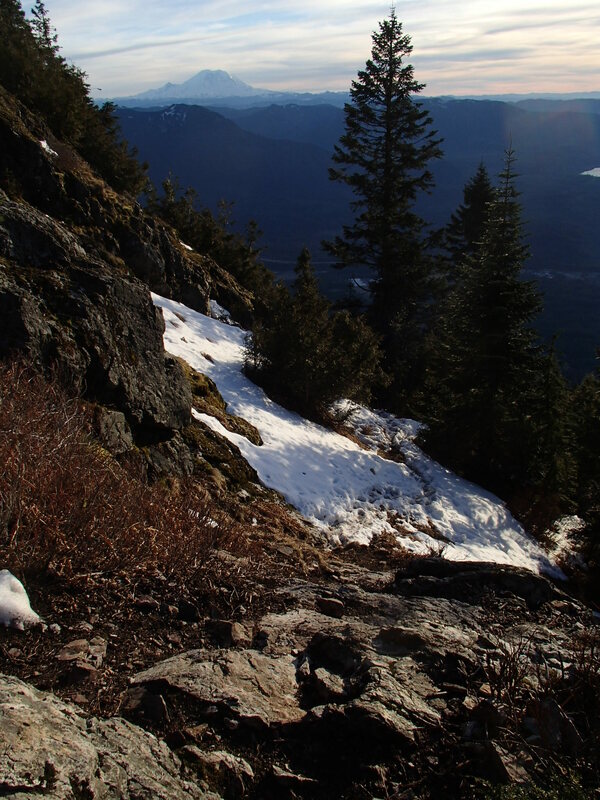 Going left will result in arriving at Mt.Si in a half hour or less, while going right is approximately another three miles to Mt.Teneriffe. Alright, come on, my legs are aching too, lets keep going…. Thankfully the grade remains mostly light and/or level for awhile giving you a chance to recuperate. The views here really start to open up as well, including an interesting view of “The Haystack” jutting forth from the conifers, seemingly eyeballing you like an immense and hungry Golem. The tread seems to go on forever until finally reaching a viewpoint to points northward, the first views of such available thus far. Take a minute to rest up because the trail begins to climb from here yet again. The switchbacks begin immediately through the upland forest, and you can’t help but feel like you are really getting close now. Then you gain the ridge and start up! Yes, finally, almost there….er, or not. 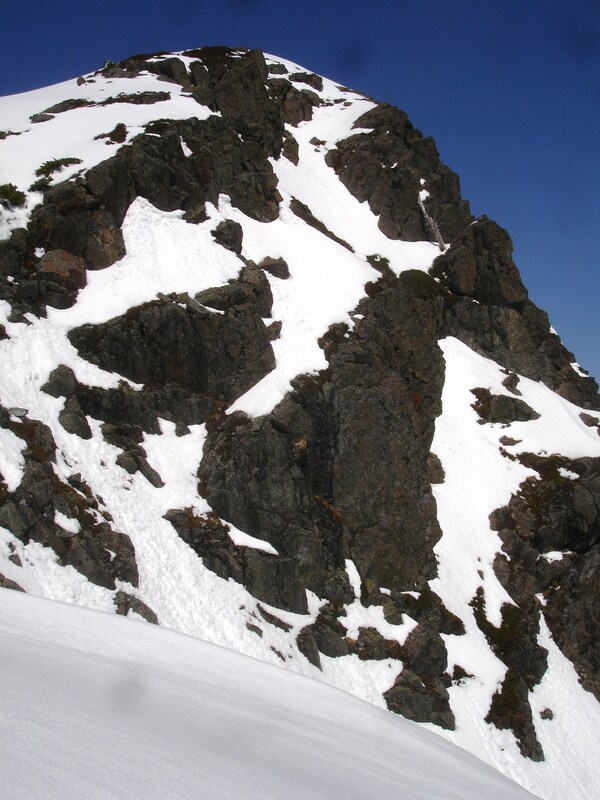 Nope, instead we find ourselves atop the high point more or less northwest of the Teneriffe summit. Even my legs are aching good now. Next the trail winds about along a very steep, forested drop off and eventually begins to climb again. This has got to be it… I think I see blue between the trees, yes it’s sky alright! Phew! 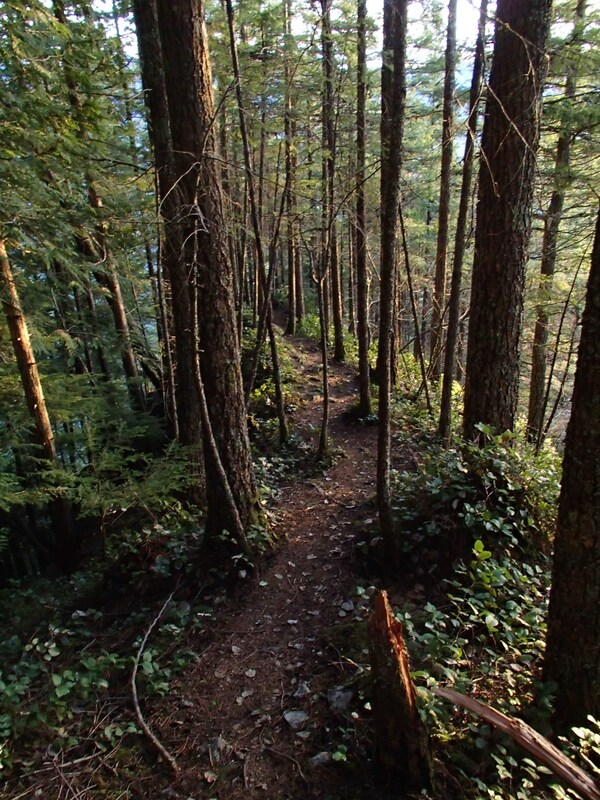 The trail breaks out of the woods and dumps you out about mid-point on the Teneriffe summit block. If you have any gas left a light scramble will take you the rest of the way up. You did it! The summit is a nice perch offering great views in all directions. WARNING: In snowy conditions Mt.Teneriffe can have a nasty cornice on top, if it gives way, or you slip, it’s a long ways down to your certain doom. When it’s time to head down you can either go back the way you came for a 14-mile roundtrip, or cut down the mileage but increase the difficulty by heading down the old trail. So beginning from the fork in the DNR road this time we bear right in the direction indicated by the nice, new and shiny Teneriffe Falls sign. The road ambles along, crosses an ephemeral creek and starts gently climbing, becoming more and more of a trail the higher you get. Small views begin to open up as you climb above the treetops before the road comes to something of an end marked with a sign. 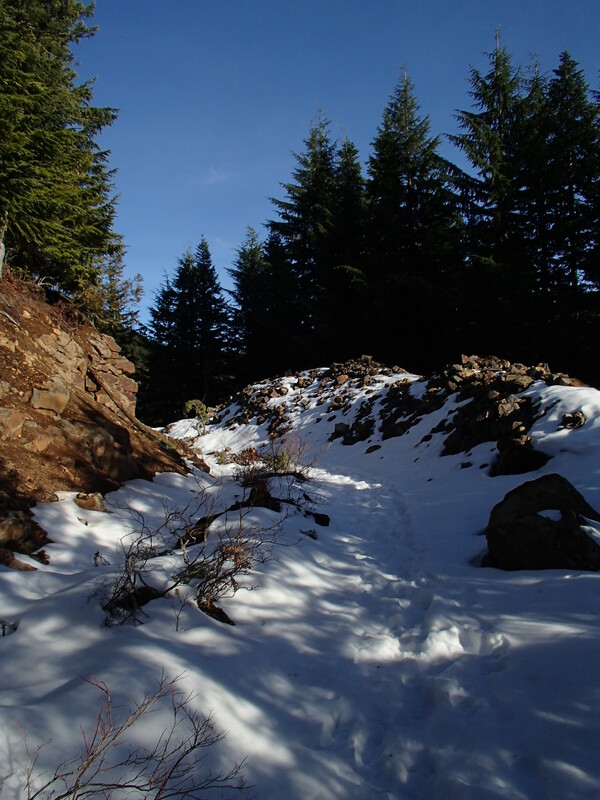 A boot path continues on along the road, but ignore it and head up onto the open talus above you. After a few switchbacks the well built trail really starts to climb, and the T/A truck stop at the exit 34 really starts to become a fixture of your southern views. Try to look beyond it. 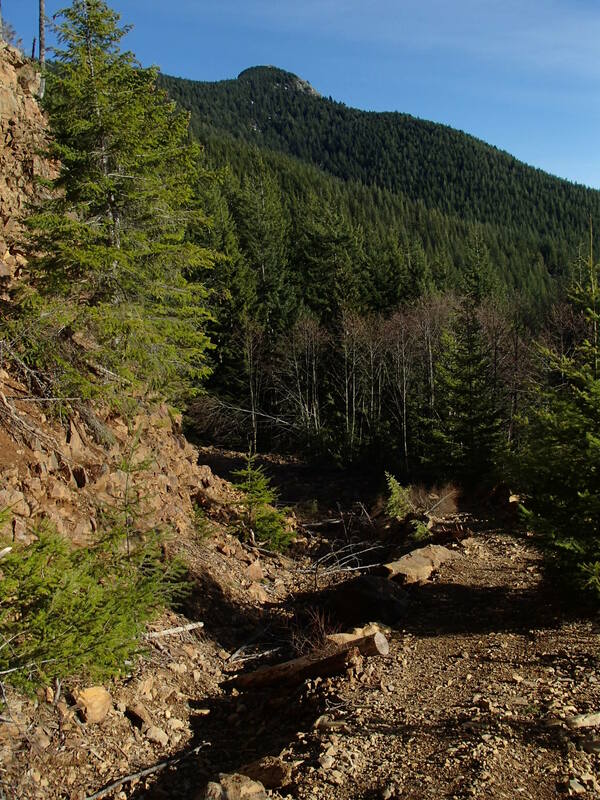 The trail continues to switchback up and up through conifer forest and talus with occasional views opening up along the way. This is a decent workout for most people, but every step is worth it when you finally reach Kamikaze Falls (Teneriffe Falls). I first knew this place as Kamikaze Falls, I don’t know what the history behind the name is, except maybe that Kamikaze is said to mean “Divine Wind” in Japanese, and usually a divine wind does seem to issue forth from the falls. This is a great destination in itself. During the summer you can indulge in a cooling shower beneath it’s cascading waters, or marvel at ice formations during winter cold snaps. Kamikaze Falls is incredibly photogenic destination any time of year. 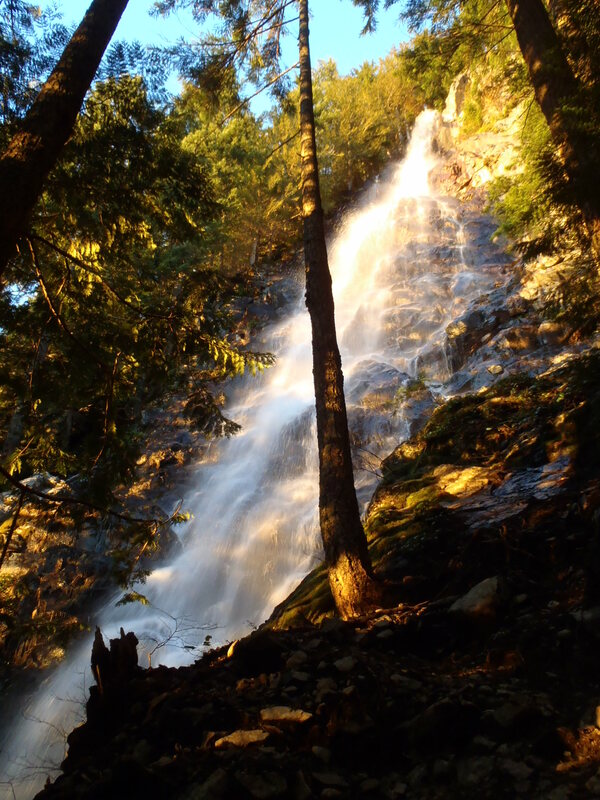 With low mileage, open views and a beautiful waterfall at the end, Kamikaze Falls is a great goal for someone in kind of the low-middle range of hiking endurance looking for a new challenge and a huge reward. 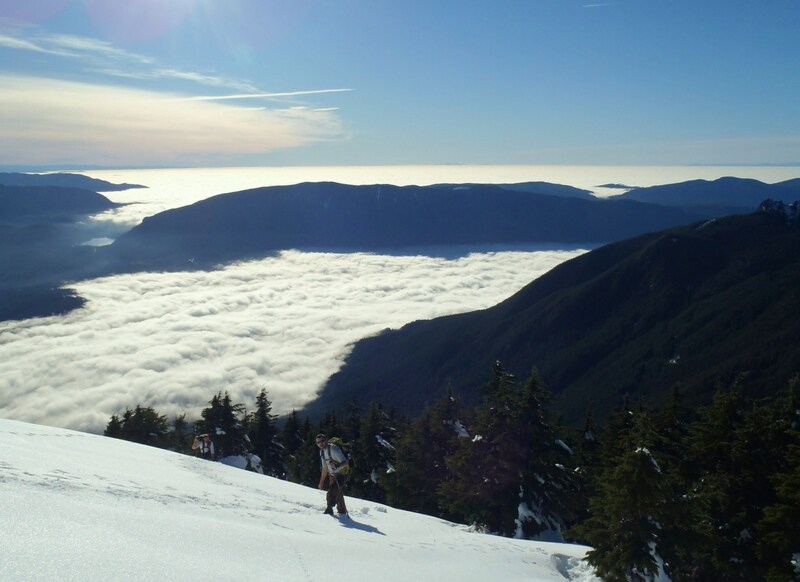 At this point if you feel like trudging up to Teneriffe Summit be warned, the rest of this hike isn’t for the timid or out of shape. 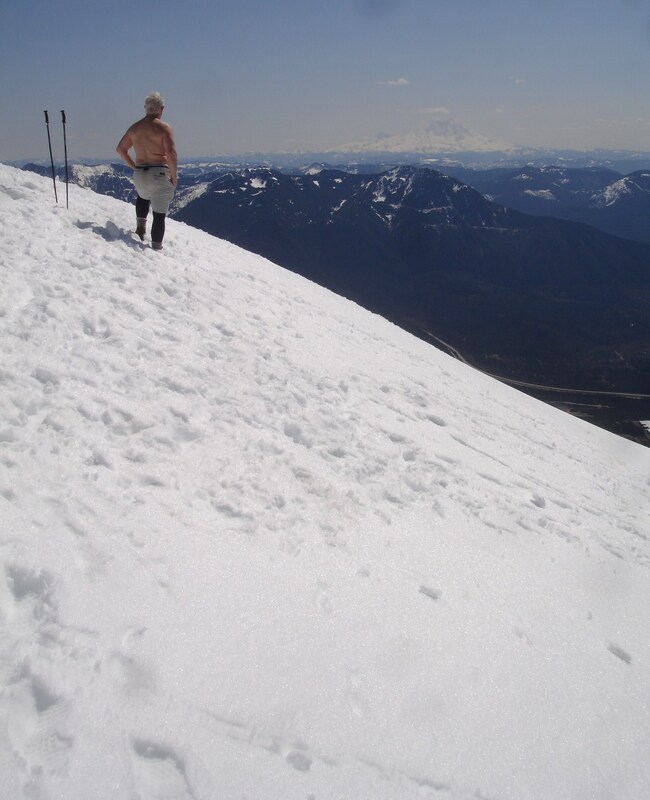 It’s steep, relentless and often nothing more than a faint boot path. Look for a trail on your right, it’s a lot more well marked these days so you ought not to have trouble finding it. The trail basically takes off like a rocket here, gaining the ridge in little time. Get used to this grade, it’s the norm from here on out. The route mostly follows the ridge spine, only deviating here and there. Occasionally light scrambling may be necessary up rock outcrops. Most of the way you will find the trail is big on gain, but short on views. However that all changes rather suddenly as you break out of the trees. On a clear day the views are fantastic! Rainier dominates the south while the burgeoning Puget Sound mega-sprawl stretches along beneath the Olympics to the west. 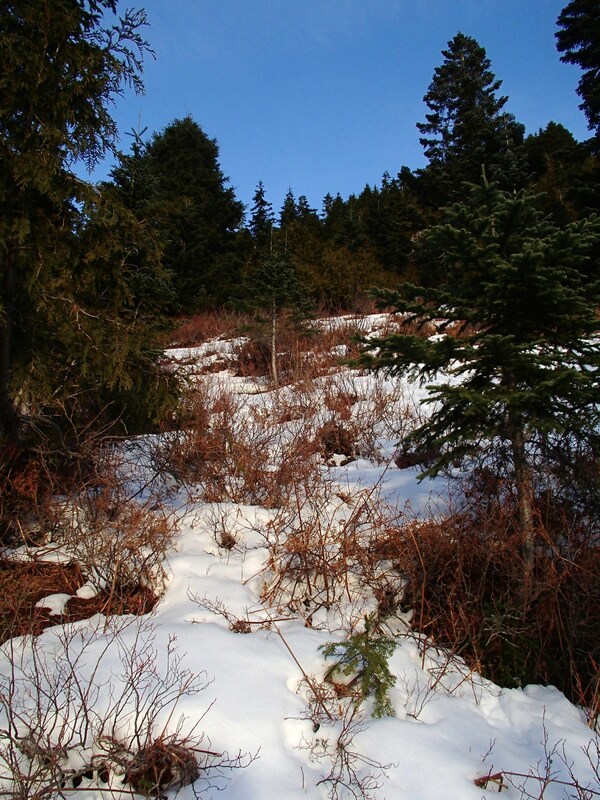 Here you will find yourself on even steeper terrain, up mountain meadows and patches of trees before coming out near the bottom of the summit block. During winter months it is advisable to bring some form of traction aid along with you, such as micro spikes or poles (or both!) it can be treacherous around here. 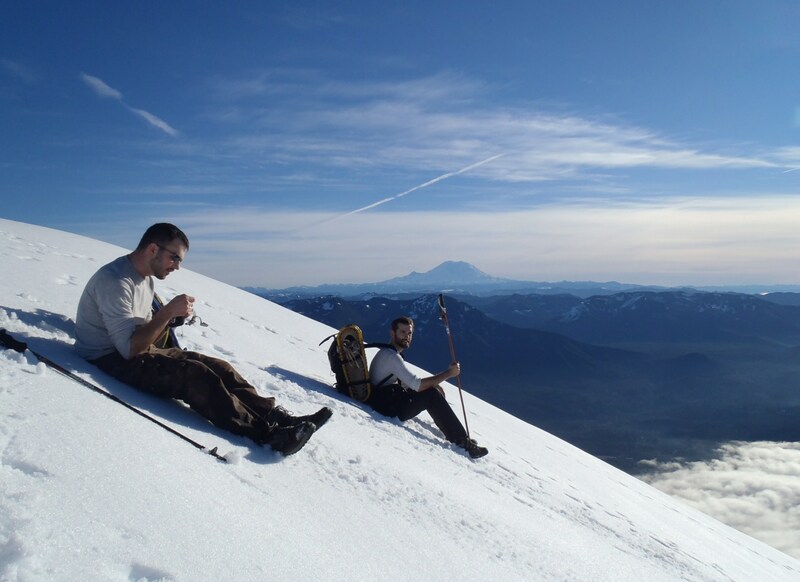 The final climb is little more than a light scramble when snow free and offers ample room for all you summit apes to enjoy a picnic surrounded by 360° of the kind of stuff some people can only dream about. 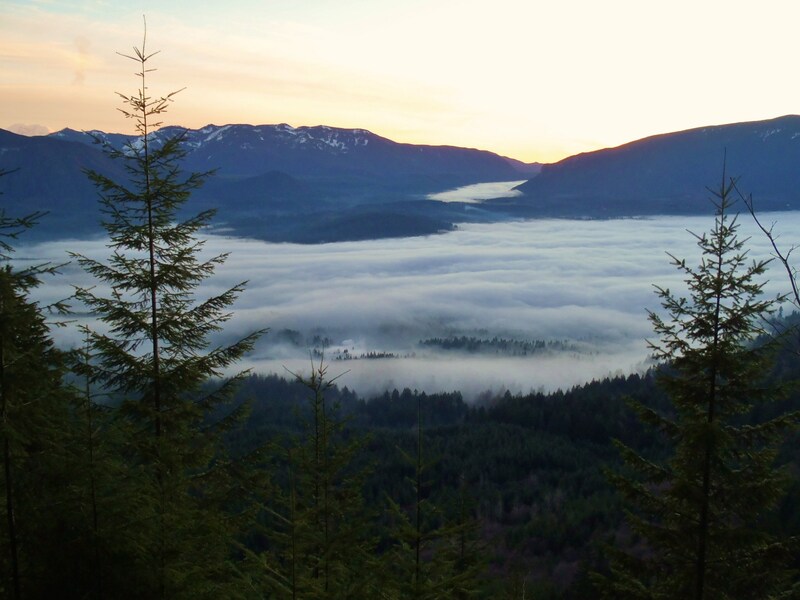 Now that you are familiar with the Teneriffe trails, from here the world is your oyster, well, if you still have some gas in the tank. 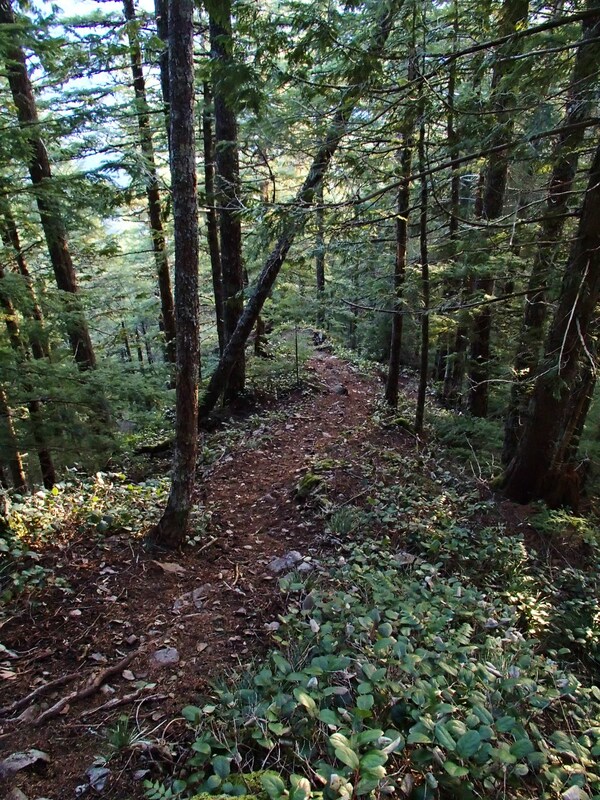 Make it a loop, take a stroll to Mt.Si or come back the way you came! As always, leave only footprints and take only pictures, oh take and any garbage you might find along the way too. Not to get preachy but just because orange peels and banana wrappers are “biodegradable” doesn’t mean they should just be tossed on the ground. If you can’t pack it out, don’t pack it in.